EXCEL is a neutral to basic, chlorine free, clear liquid solution. Each gallon of EXCEL contains 3 pounds of Potash and 2.1 pounds of Sulfur. Excel can be tank mixed with Ultra-Green or Manga-Plex to provide a complete nutritional mix. 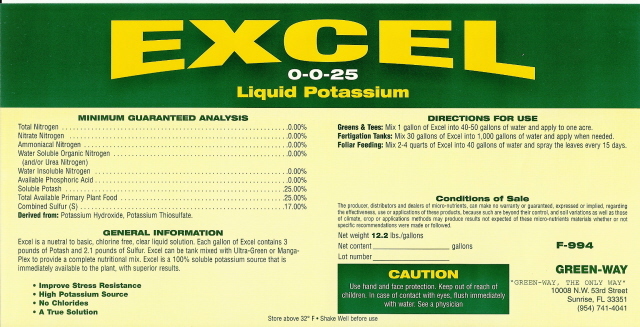 EXCEL is a 100% soluble potassium source that is immediately available to the plant with superior results.